We had a very unexpected laugh until your gut hurts happiness moment last night. They both came into my room and I let them read the meme. Pretty soon they were both laughing as hard as I was. Then Jacob says you know what my brain does when I go to bed? I’ll be lying there almost asleep, I’ll say “ok good night brain it’s time to shut down now” and my brain says “you know what you haven’t thought about for a long time? Monsters under your bed”. I asked him if he needed me to get my pillowcase and go monster hunting like I used to do when he was 2. We all laughed again and then laughed about monster goldfish smiling back from under the bed. We lay on my bed and laughed for almost a half hour. This is what this quest for happiness has brought us. Enough of the fear and pain is gone that now we can embrace the joy. It was an awesome late night happiness moment. I love how reading a facebook post turned into a special time with your children. These types of moments are the ones children remember after they have grown up. I’m reading The Ageless Woman by Nancy Lonsdore. It’s required reading for my course but is really good and describes Ayurveda well. It’s written for women after 40 going through the change, but really applies to everyone. It’s interesting and easy to read. I finally remembered to send you a title!! So good post.. ! 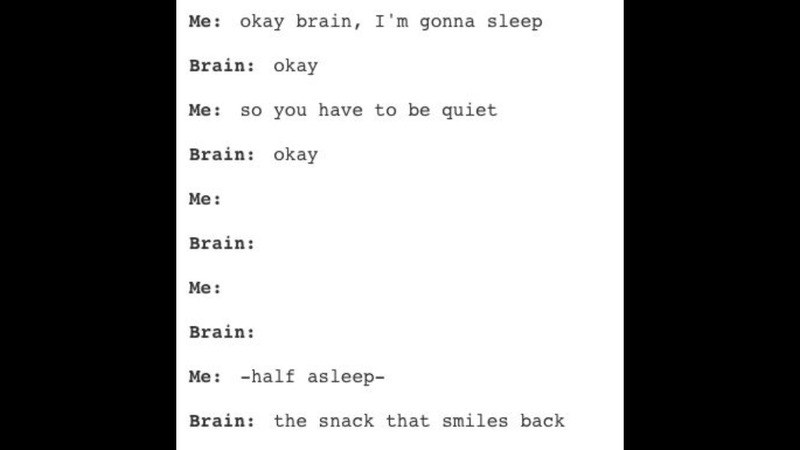 Brain gets stupid at night.. lol..